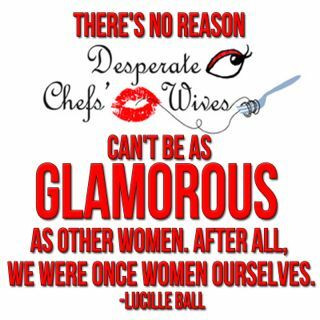 Desperate Chefs' Wives: Desperate Chef's ...Butcher? I was digesting the latest episode of LOST last night in bed when I came to a revelation: "If I had to work in a restaurant I think I'd like to be a butcher. I think I'd be good at analyzing a slab of meat and deconstructing it." 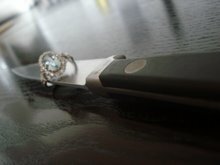 To which my lovely chefhusband replies: "You could never be a butcher, you'd have to sharpen your knife every night". Oh wow, thanks for pointing that out, I was just about to quit my amazing teaching job to be a butcher! GEEZ, can't I just have a stupid, silly pipe dream? Seriously! What would you want to do if you had to work in a restaurant? Would you be a pastry chef with a clean, precise job? Would you be a sommelier decanting and suggesting? Or would you be a chef, demanding, compulsive and powerful? Not really knowing all the tasks are that are involved in what these people do...I am going with Sommelier. From the outside looking in, this "appears" to be the most classy and romantic of the positions...I am wrong aren't I? I'd probably end up doing front of house. Maybe I'll have a real answer to this soon, because my chef is opening his own restaurant! I keep saying I don't want to be involved, but I have the feeling I'm going to end up hostessing or bartending or possibly even managing, who knows? I'll keep you guys updated! BB, I think you should work at your chef's place! At least in the beginning so you can see your restaurant baby grow. If my chef opens a place there is no way I wouldn't be all the time. He thinks he has paid his dues to the kitchen world...what about me? Passion, You are right on about the sommelier..seems very romantic. We should track one down to really find out. I wanted to share with all of you the extent that Hilary is not cut out to be a butcher (even in this fantasy world of hers). When I asked her to take a brisket out of a brine solution and cook it in the pressure cooker she asks, "Do I actually have to touch the meat?" I think that she would be good at several jobs in a restaurant... But the butcher is not one of them. Analyze and deconstruct a potato, then we'll move on to meat. 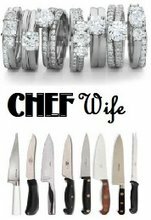 I love love love this blog but...just a little correction when you give the definition of CHEF'S WIFE should the term not be PPX that means VIP not PX, UNLESS that is a term I am not familiar with. We know PPX AS THE CORRECT TERM BUT sorry trying to be nice and make sure thAT THIS BLOG IS NUMBER 1 b/c in my eyes it is. Just tryig to be helpful!!! lol!! A blog post has inspired a ChefHusband response! I love it. What else can we say to rile our chefhusbands? Owner? No, not unless I have a faithful minion of a manager. You really DO have to be there. Silent partner who gets a cut each week is fun. Love the cash- and comps. To the chefwife who envisions herself being at the restaurant all the time when her husband's the owner, I did that for some time, and I have great memories of my husband's place and the staff, who became our best friends out of convenience. However, I've cut back on that b/c I found myself coming home depressed to realize how much fun he's having while I'm on the couch waiting up for him -or at my relatively lonely job. That, and you realize that these people get more of your husband's energy and time than you do (at least during the busy seasons), and you realize that he's got a whole family in addition to yours. No matter what, you're the boss' wife and kind of on the outside. It's a tough gig. But yes, the free food and booze, and always having a place to go "where everyone knows your name" is pretty great! Helping out is complicated - there are those moments where even the coolest husband resorts to "what do YOU know about this business" (regardless of the fact that I waitressed, hostessed, and am still in touch with the customer's view). Just be prepared for strange dynamics and try not to take it personally. The rewards are there if you keep the lines of communication open. Sorry so long and babbly. First, I love the when the chef comments and the picture is awesome! Having worked front of house, I now know with certainty that I would prefer working in the back away from customers. They can be awful! Although I love my profession, I dream of being a pastry chef. Working with sweets, how can that be bad! But as a side note, I totally understand the attraction to being the butcher - something about the knives. I'm a hostess at my boyfriend's restaurant. I think my glam appearance in my hostess gear every night is what attracted him to me in the first place... he's discovered now that when I get home, I look like a complete slob. I have dreams of moving to France and becoming a pastry chef though... *sigh*. PS restaurantbride - Like you, I'd also like to think of myself as one of those 'sharper' hostesses, my boyfriend isn't a big fan of those "dumb chicks" either, otherwise he'd long have been involved with most of the hostesses and waitresses who throw themselves on him. Ahhhhhh so great to hear from people in the same boat! I met my chef while working as a restaurant manager, and once I left to have a baby, I said I would never go back. Well, now we're opening a restaurant. I wanted to be his pastry chef, but alas, he had me pegged as his maitre'd. It's a small kitchen, so maybe he was worried that after a few weeks surrounded by desserts, my bottom would no longer fit. A girl can dream, though. chef wife- (noun) a woman in a relationship with- although not necessarily married to- a chef. Usually has two careers, her own and of course that of her chef. Understands terms such as: “doubles”, “PX”, “covers”, and “purveyors”. Doesn’t understand but deals with concepts like: dinner at 2am, chefs that smell like onions and fish, Christmas (and every other holiday) alone, callused hands, and mac and cheese dinners at home, and the always prevalent conceited attitude. After all, aren’t they kind of a big deal? I''m on a journey! Do you want to know what I've been up to? How quickly life passes, blink and its gone! This Isn't What I Ordered! Win 2 Books: Simmer Down and Turn Up the Heat! Endorsable-Not that I get paid for these, but I just love them that much! I'm a twenty something chefwife married to a twenty something chef.